Bailey Murph, MPH, is the new outreach program manager for the DFMCH’s Office of Community Health. In August 2017, the UW Department of Family Medicine and Community Health (DFMCH) welcomed Bailey Murph, MPH, as the outreach program manager for its Office of Community Health (OCH). Murph joined the department after serving as a health portfolio manager at United Way of Greater Milwaukee and Waukesha County. There, she oversaw a portfolio of 61 programs representing United Way’s largest investment. 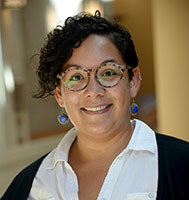 She holds a Master of Public Health in Community and Behavioral Health Promotion from the University of Wisconsin–Milwaukee Joseph J. Zilber School of Public Health, and also completed a two-year UW-Madison Wisconsin Population Health Service Fellowship. In her role at the DFMCH, Murph is working closely with OCH Director Jennifer Edgoose, MD, MPH, to develop a comprehensive mission and vision for the OCH, which was created in 2015 to promote and enhance community health-related efforts in education, research and patient care. The Northeast Family Medical Center adopted a local elementary school, sponsoring wellness days, providing health education and facilitating efforts to address food insecurity. It also partners with Madison Fire Department and Public Health of Madison and Dane County to provide outreach and support to the high-risk residents of Dryden Terrace, a nearby low-income housing complex. The Verona Clinic, through connections with local grocery stores, fitness centers and a chef, established a novel 20-week clinic-based obesity support group that helped participants improve hypertension, weight, lab metrics, mood and satisfaction. The clinic has also produced thousands of pounds of produce for a local food pantry through its community garden, and established culinary education programs for children and the elderly. Access Community Health Centers Wingra Family Medical Center developed a resource navigator program in collaboration with the UW-Madison Center for Patient Partnerships. In this program, which is also now offered at Northeast Family Medical Center, trained undergraduate students screen patients for social determinants of health and connect them with resources they need to be healthy, such as housing, utilities, transportation and other services. Belleville Family Medicine held an eight-week “Walk with a Doc” program; partnered with the local police department on an event to educate families about fishing, bike safety and helmet use; and participates in a coalition to address underage drinking and drug use in the community. Kevin Thao, MD, MPH, a faculty member at the DFMCH’s affiliated Wausau Aspirus Family Medicine Residency Program, partners with local organizations to conduct the Survey of the Health of the Wausau Area Hmong Population and improve Hmong health in the community. She and Dr. Edgoose continue to build trusting relationships with community partners, with the goal of developing future DFMCH programs to improve community health outcomes. They are also collaborating with UW Health’s Office of Population Health as it implements community health improvement strategies across Dane County.